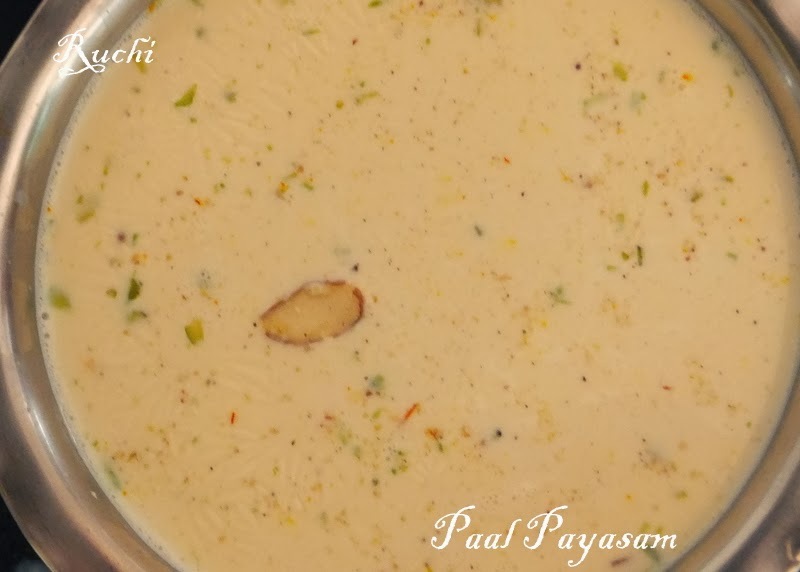 Pal Payasam is a traditional dessert .It is prepared on special occasions and festivals. This recipe of the pal payasam or the kheer is very simple to prepare and very tasty recipe The best taste for Pal Payasam is when the raw rice is cooked in milk on slow heat in heavy bottomed vessel or in pressure cooker which turns out very light pinkish in color finally. I usually prepares it by boiling the rice in milk over stove top which is very time consuming but it adds a nice creamy taste .There are two ways of making it. First, one where you reduce the milk to half by heating it and then adding sugar.The second one is where you reduce the milk a little and then adding condensed milk which makes it thicker and tastier.When you are using condensed milk there is no need to add sugar. . But now a days I prepare PalPayasam in Pressure cooker. Pour the milk into cooker and bring it to boiling be sure that the cooker is only 1/2 or little more than 1/2 filled and not fully filled. Add washed rice into this and stir well. Open the cooker after the steam is released completely. Keep it on stove with full flame and allow boiling for 5 min. Once rice gets cooked now add sugar and mix for 2 mins till the sugar is dissolved stir it well. Delicious palpayasam is ready to be served .Garnish with aromatic spices. Note: Adjust the quantity of milk and sugar given here as per your taste.. You can add sugar anytime if you feel the sweet is less.